Ooops! Nearly forgot! But what with all the 'stuff' (all the descriptive words in the English dictionary and I use 'stuff' .....hmmmm, oh well!) going on in November, plus Ella's birthday on the 2nd, illness and governor work I don't know where November went! Oh wait, yes I do, NaNoWriMo! Well I started like a greyhound and ended like a tortoise because all that blessed stuff got in the way towards the end so didn't make anywhere near 50k. But still, pleased with what I did accomplish, really helped me focus. And I found I love the Scrivener software, so although I won't be getting the 50% discount for completing NaNo, I still think it's worth the money - $32, which is around £20. Well worth it :) Do I get a further discount do you think for extolling their wonderfulness? I of course haven't yet edited what I did write - could turn out that out of the 24612 words I did write, only 612, or worse, 12, will actually be any good! Will leave that unravelling for another day. So congrats to everyone whether you wrote 1 word or 50,000, that's more than you started with :) Right off to pay for Scrivener while I remember and jump the shark - sorry, jump some blogs! Regarding that, just an observation from the past few months, but has anyone noticed how many people actually pop in? I have noticed that nearly all are either the helpers, or bloggers returning my visit. Not sure how many people are doing the blog hopping much, which seems wrong. It's like not really supporting, more sitting back and expecting others to run around after you? Last months comments were nice, but they came from the facebook group. Whinge over, it's been bugging me for a couple of months. Regarding your observation about people hopping around to new blogs--that is one of the reasons I volunteered to co-host this month. I usually visit a few new blogs, but I was determined to visit more and make a huge effort this month. My observation is that people tend to visit the same sites. Force of habit. And, as you know, we're all strapped for time! This gives me a good excuse to extend my travels. Good luck finishing and editing your NaNoWriMo ms! Hi Kim, thanks for co-hosting, I don't give up, just a bit frustrated - but like just said to JoJo above, the dead links are even more annoying LOL! I do try and visit lots of blogs during the hop, depending on how life and kids are at the moment. They don't always come back to me, but I enjoy being a cheerleader for them, especially when insecurities are getting the best of them. Yay for getting some words down in November! Congrats on your achievements with NaNo. 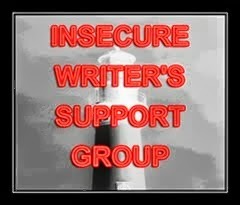 With IWSG I try to visit as many blogs as I can, some are people I interact with quite a bit but I try to visit at least 3 or 4 new ones from the list as well. Also keeping my fingers crossed for more than 12 good words! 50K is an ambitious goal. Even with no distractions (or 'stuff'), it can be hard to reach. There are those who manage to somehow go over (or even WAY over), but we can't hold ourselves to others' standards. Returning your visit to my site. Had to become a dead link on IWSG list when life overtook me, as usual. Sadly I'm an erratic blogger, blog visitor, and writer. Anyway endorse what you said about Scrivener, which I just used for first time. Really pleased with it. Hey Suzanne, thanks for popping in at my place! I too believe that if you sign up for a Bloghop, then you should REALLY try to get around to as many participants as possible. Congrats on your 24612K words. I'm in awe of any person who attempts NaNo! Congrats on what you wrote for Nano. You're farther along than you were before.